Schedule your next meeting in one of our 'Events Suites' at Crowne Plaza Marlow with 9 state-of-the-art Meeting Rooms with an abundance of natural daylight, unlimited high-speed Wi-Fi, Electronic Screens, Data Projector, with tailor-made Day Delegate & Residential packages and a dedicated Conference Manager to ensure all your requirements are attended to. The hotel is the perfect venue for hosting Breakfast Mornings, Conference Calls, Seminars, Networking Events, Creative Meeting Space, Interviews, 121 sessions, Conferences or Product Launches. Receive a complimentary Spa Treatment for the Meeting Organizer when booking your first 24Hr Package for 25 or more delegate. Receive an upgraded refreshment break for any conference booked in our Conferences rooms for 10 or more delegate. Book your first conference at Crowne Plaza Marlow and receive complimentary Bacon Baps with your Tea & Coffee on arrival. 24 HOUR RATE FROM £195.00 PER PERSON. PLEASE CONTACT A MEMBER OF OUR M&E TEAM TODAY ON 01628 496 819 | events1@cpmarlow.co.uk QUOTING 'THREE FOR FREE’. * Subject to availability. Complimentary bedroom applies to 1 in 50 bedrooms. Bedroom upgrades apply to 1 in 100 rooms. Welcome drinks reception includes 1 drink per person. Canapés include 3 Canapés per person. Valid for any bookings that take place before 31st December 2019. No matter how stunning or comfortable your offices and meeting rooms, it is often impossible to hold a meeting without being disturbed by colleagues 'just asking this or that' or frequent telephone calls. In order to have a truly productive meeting, the best solution is to leave the building and escape to Crowne Plaza Marlow, where we offer peace and quiet and no interruptions. 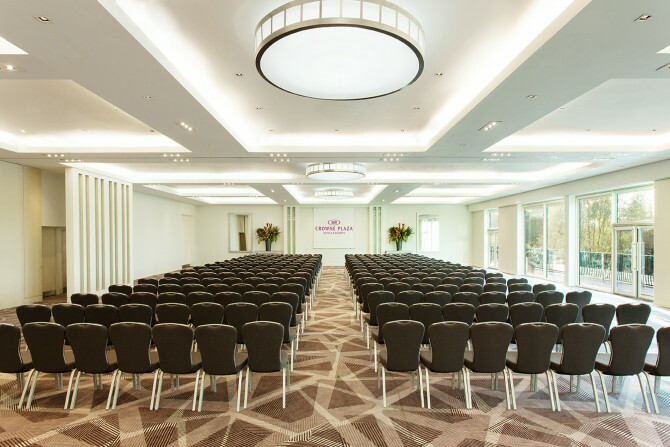 With 168 contemporary en suite bedrooms to choose from including stylish Standard Rooms, King Rooms, Executive Club Rooms and Luxury Suites, the Crowne Plaza Marlow offers plenty of accommodation for your delegates, should your company want to extend your meeting across more than one day. The hotel ensures that your delegates can ‘stay connected’ at all times, with 3 in 1 USB charging cables in bedrooms. *Applies to Day Delegates only.